At one point in the last 24 hours, the number of concurrent users on Steam peaked at around 6.9 million people. 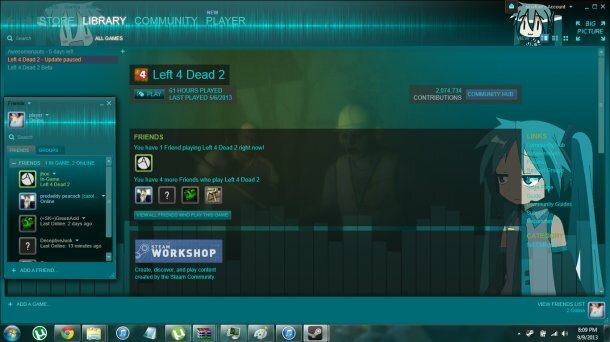 A lot of time is spent staring at Steam’s familiar grey interface, and it’s time for a change. 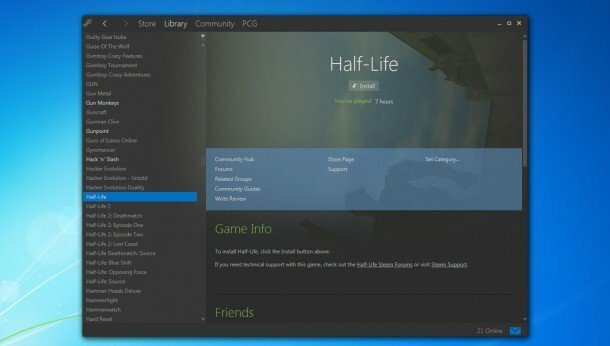 Fortunately you can reskin your Steam client with user-made varieties, which change the look, feel and functionality of Steam’s familiar old tabs. Read on for our pick of the best Steam skins, and a round-up of some of the most outlandish designs. 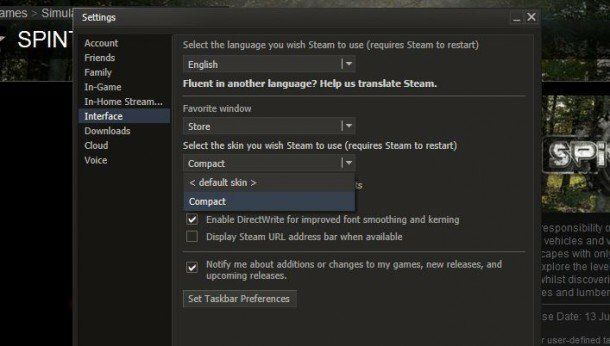 Before we get to the round-up, let’s run through the surprisingly easy process for installing a Steam skin. 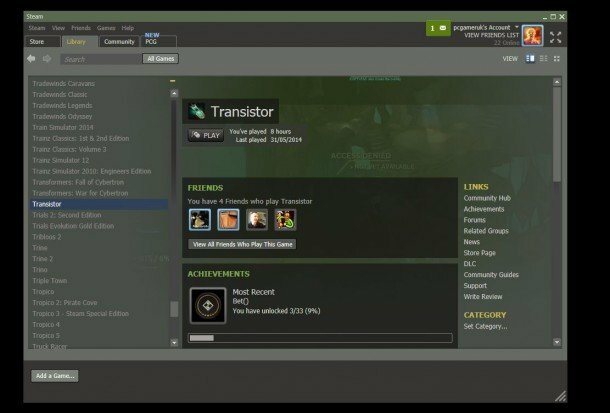 Extract and drop them into your Steam skins folder in your Steam directory. 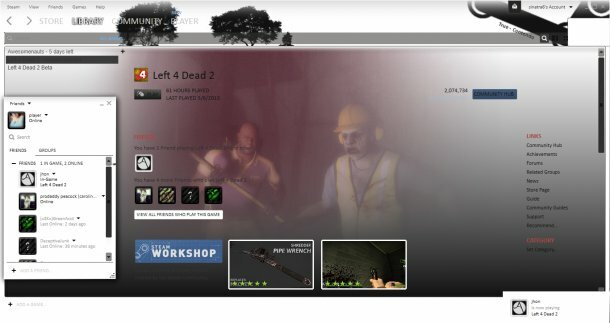 C: -> Program Files -> Steam -> Skins. 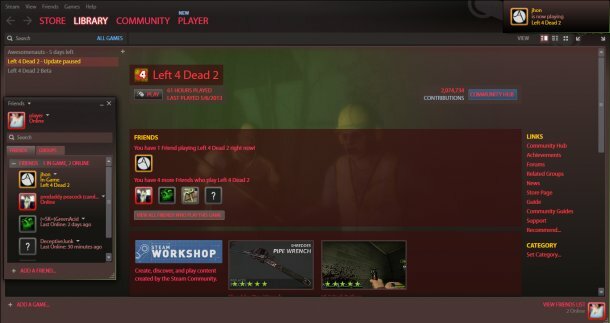 Pick the skin you want from the “select the skin you wish Steam to use” drop down menu. 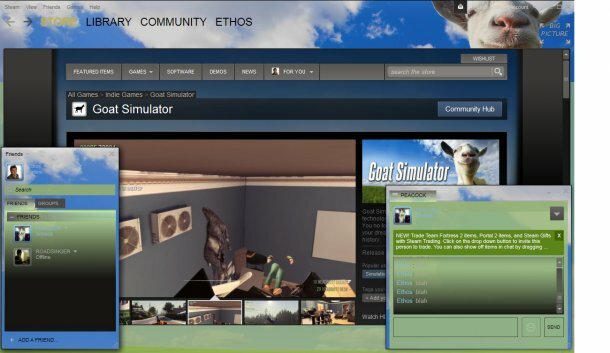 Caress your beautifully reskinned Steam client with your mouse cursor while muttering “precioussss” to no-one in particular. Voila. 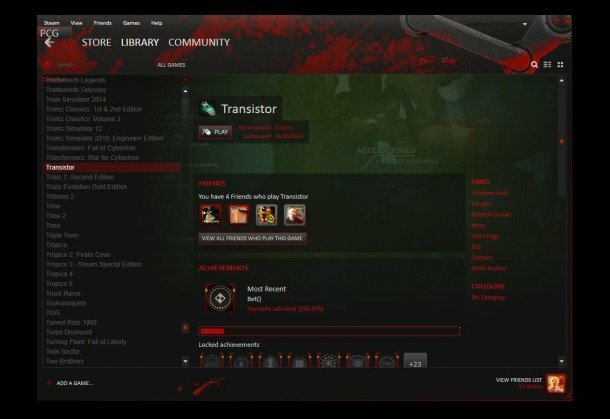 Steam makes it very easy to install multiple skins, so you can download a few and then flick between them to test them out, and find the skin that’s right for you. Head to page three for our roundup of some unconventional choices. Your individual favourite will be a matter of taste, of course, but we’ve prioritised elegant designs that present your library and Steam’s functions in the most readable fashion. Our top picks, Metro and Air, are the go-to choices for a few members of the PC Gamer office, and come highly recommended. 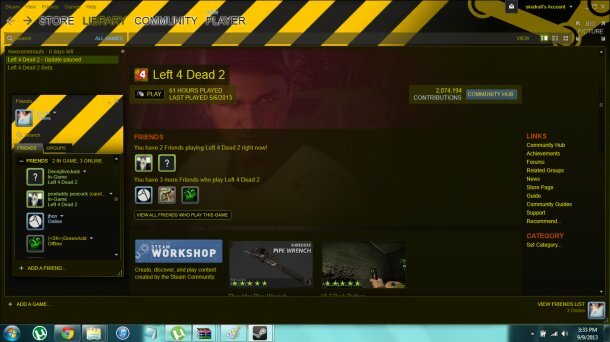 Head to BoneyardBrew’s deviantART page to download his snazzy Metro UI skin. Inspired by Microsoft’s current UI, he’s based its clean style and customisable colour scheme off their design language. It features crisp game tiles and new-style buttons. Like all the best skins, Metro also refreshes the in the in-game overlay, bringing that clean composition into your games. Pixelvision delivers a clean, serious and easily parsed look in the same vein as Metro and Air, but with extra hatching and a subtle bluish tint that gives the skin a bit more attitude. It comes with its own fonts you’ll have to install alongside the skin if you want to enjoy Pixelvision at its best. Here’s something a little lighter on the eyes, perfect for all-nighters. Blue glare from the monitor might even make your room resemble that of a Bond villain’s undersea lair—an added bonus. Bright colours can quickly become wearing (if you’re looking for bright skins, move onto the next page for some that are almost painful) but the calm cobalt tones of Blue Pulse are easy enough on the eyes to make this skin usable for extended sessions. Darth Tealc’s takes cues from trains at rush hour, overpriced city apartments and defunct disc formats by making Steam compact. The redesign minimizes empty space while still making all the tabs, icons and categories readable, which is no mean feat. It’s not a complete overhaul—just a tighter, neater spin on an existing formula. 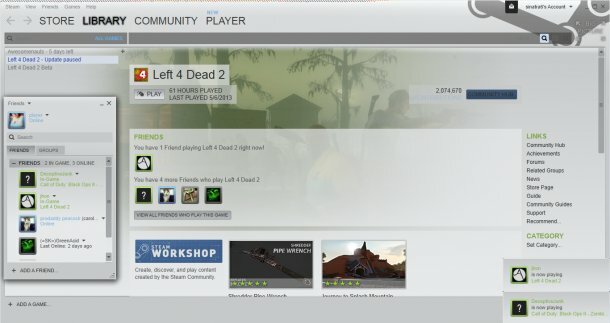 I’ll likely seem a bit busy and cluttered to some, but if you like to keep your Steam window small, you’ll see more information with this skin. Do you yearn for the early noughties, when indie rock was played on the radio and games didn’t charge for map packs? 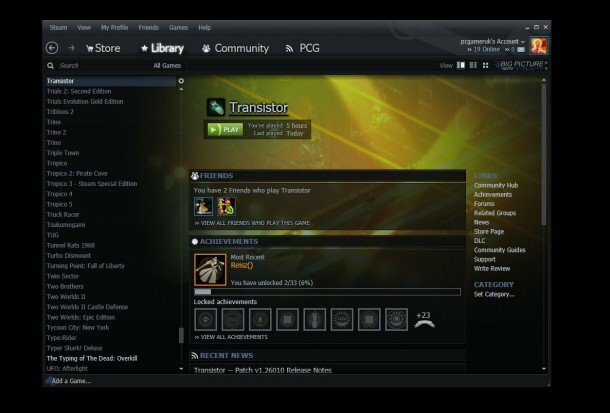 Download Darth Tealc’s throwback to classic Steam and relive your youth. Or, for some of us, a time when we were slightly less old. 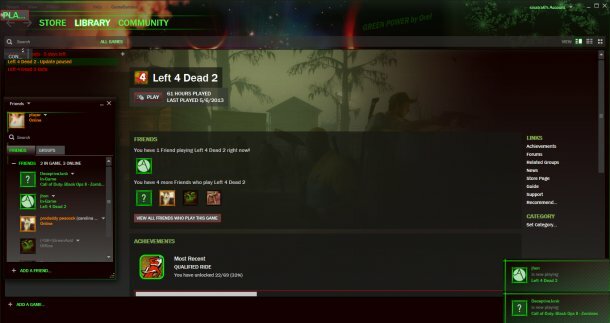 It’s not exactly better than modern Steam, but the power of nostalgia is strong. This refreshing, soothing skin is the visual equivalent of sucking on a Solero ice lolly while someone squirts milk in your face in a totally non-sexual way. 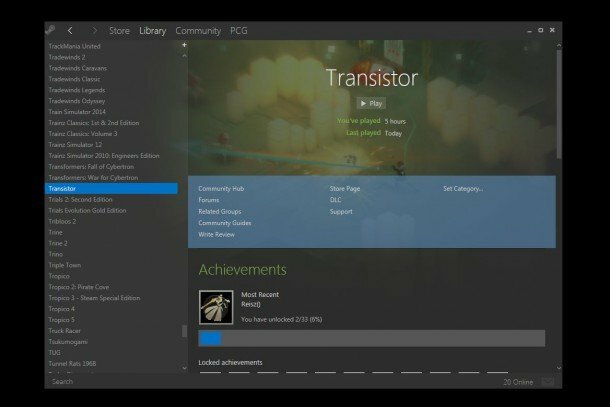 The switch away from Steam’s gunmetal grey makes the program feel almost unnervingly different. 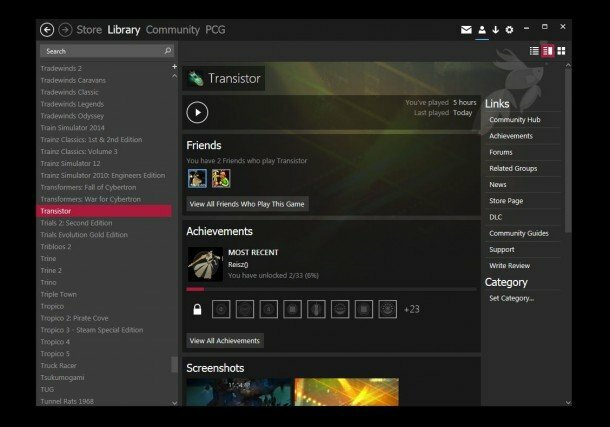 The main browsing tabs have been shifted to the right of the client, which takes some getting used to, and the familiar tabs are now displayed as Windows-style drop-down menus. Alex’s blood-splattered theme is the perfect accompaniment to a marathon session of Killing Floor, Left 4 Dead or Mortal Kombat. It’s the sort of Steam look Dexter would go for. 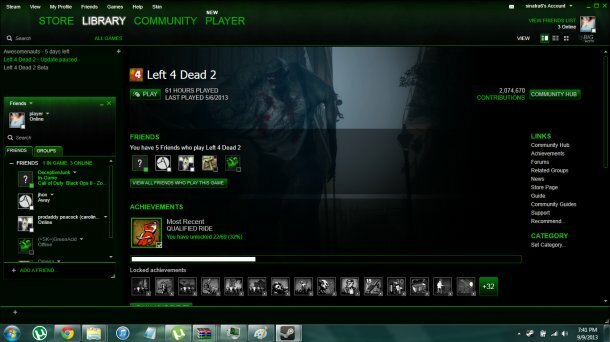 The blood theme remains consistent throughout the design, though there is one annoyance—your user tab moves to the top-left corner of the client. If you hardly look at your profile and like the gory aesthetic, that’s easily overlooked. These skins don’t exactly come as recommended, per se. They’re a little too wild and outlandish to appeal to everyone, but that’s not to say they won’t find some fans. 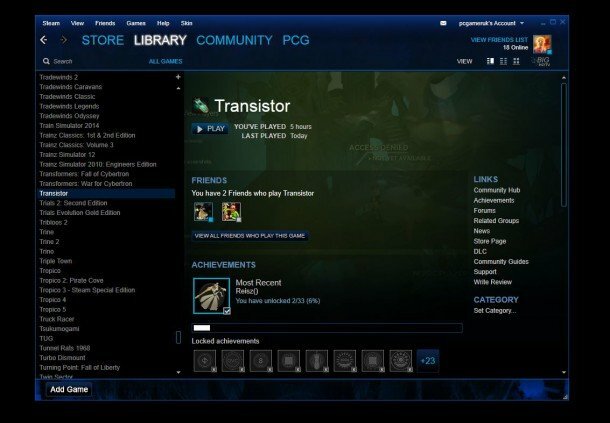 These choices serve to demonstrate the breadth of Steam skins out there. You can find many more at Skin Your Steam and Game Banana. Check out this Miku skin. If you weren’t aware, Miku is a humanoid persona voiced by a singing synthesizer application developed by Crypton. 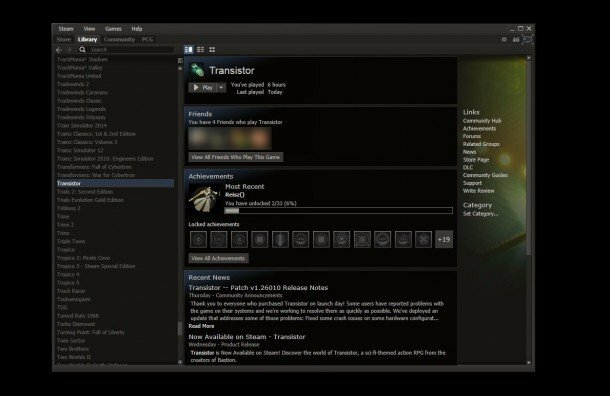 Someone has trapped her inside a Steam UI skin. She’ll be there, staring forlornly every time you boot up your client. Just like the game, this skin will make you laugh for precisely six seconds until the joke gets old and you delete it from your hard drive. But man, what six seconds they are. This Inverted Skin by UltIm4t3 Luk1 turns the world inside out, upside down and round and round. Black is now white, white black. If you dislike the Windows look of Ice Pick, this represents a more conventional alternative with a dishwasher-white theme. 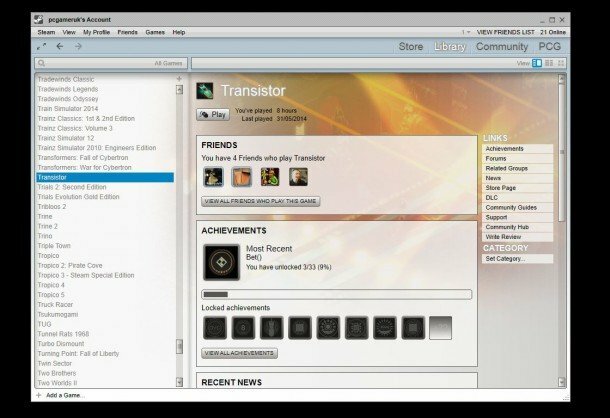 It’s what Steam might look like if Apple owned it. A reference to The Green Lantern, or merely a coincidence? Shades of Darwinia in this cosmic skin from SkrillEniXx, which turns Steam into a portal into the centre of the universe, and then uses an angry, glowing lime tone to make the text pop out. Nothing screams SOMETHING IS WRONG quite as effectively as DankyKang’s Alert skin. For when you’re in a ‘take no prisoners’ kind of mood, or when you want to be reminded of your glorious job driving forklifts down the depot, or of a recently taped-up crime scene. Live out your Matrix fantasies with this hacker-inspired theme. You can pretend you’re implementing long lines of complex code in an ’80s movie about hackers, when really you’re just booting up XCOM. Good work, Asphira. Think of Mick Hucknell when you give Da11aS’ Simply Red theme a whirl. Granted, it’s not meant to be an overt reference to the excellent English soul band, but that doesn’t stop Ben from singing Stars at the top of your lungs as he flicks his way through it. It’s actually more pink than red, so prepare yourself for that before downloading. If you want to see items from your Steam library emerging from a pure white mist as though they’re peering through a portal to the afterlife, Contendo should be your first choice. The bright ice-white paneling means lots of glare, just don’t go into the light. Repeat: don’t go into the light.